Ligaments are responsible for holding bones together physiologically like strong bands of tissue. 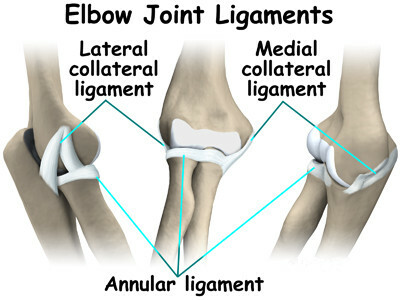 Ulnar collateral ligament or UCL, lateral collateral ligament and annular ligament form the ligaments in elbow. Here we will look in detail about the ligaments, the common injuries affecting them, how they are diagnosed and treated. The UCL is responsible for holding the ulna to the humerus which are bones of the lower arm and upper arm respectively. If the UCL gets damaged due to any injury, it can result in the elbow becoming unstable. These 3 ligaments together allows for both rotation and stabilization. This is also known as the medial collateral ligament and has two bands which are triangular in shape, namely the anterior and posterior bands. Both these bands originate from the medial epicondyle of the humerus and pass over the inner side of the elbow joint. The anterior band goes on to attach to the top frontal part of the ulna, which is referred to as Coranoid process. The posterior band attaches to the back of the ulna, also called as the Olecranon process. Also known as radial collateral ligament, this ligament is short and narrow. It passes from the lateral epicondyle of the humerus and attaches to the other ligament of the elbow – annular ligament. This ligament is made of a band of fibers which helps in keeping the radius connected to the humerus, by circling the head of the radius. The annular ligament keeps the radius bone stabilized in the elbow joint. The movements associated with this ligament are rotating movements, like turning a key or a screwdriver. When this ligament is injured, pain on lateral sides of the elbow can be felt, which does not go away with time. Tennis elbow also involves injuries to the annular ligament. This ligament helps in the flexion of the arm, where the elbow joint acts as a pivot. When this ligament gets injured, it causes pain on the inside of the elbow, which can be confused with injury of the medial epicondyle. This type of injury is most commonly seen in athletes who are involved in overhead throwing, like baseball pitchers. In case of torn ligament, a surgery will be required to repair or reconstruct the ligament. These are group of injuries affecting the structure of the medial parts of the elbow, including medial epicondyle, medial collateral ligament and medial epicondylar apophysis. These injuries occur due to excessive stress and overuse on the elbow joint, for example, to somehow who has been doing year round training. FOOSH stands for Fall On Outstretched Hand. FOOSH injuries commonly cause the elbow to be injured. When you try to break your fall by your hand, there can be excess stress exerted on the ligaments, which leads to its injury. Depending on the symptoms presented, the doctor will ask for activities you involved in as well as your medical history, and perform a physical examination. X-ray and other techniques might be required. Ultrasound can be performed on the elbow joint, which sends soundwaves and creates images on the screen. MRI, can also be used, which uses radio waves and magnetic field to generate images in detail. Another test to be taken is an arthrogram, where a dye is injected and followed by either X-ray or MRI. The first step is to give complete rest to the elbow, so that the inflammation and pain subsides. Depending on the severity of the damage, the range of movement will be restricted. If there is a tear in the ligament, further examination is needed, and a surgery can help to correct, repair or reattach it. It helps in improving the range of movement, endurance, strength, co-ordination and proprioception. To restore the complete functioning of the elbow, extensive home program must be done. MTT or manual therapeutic technique, which includes giving soft tissue massage, joint mobilization to modulate pain and reducing soft tissue or tendon irritation. It helps in restoring normal joint mechanics and the overall range of motion. Therapeutic exercise helps in strengthening and improving the performance of the elbow and its surrounding muscles. Neuromuscular reeducation (NMR) involves restoring stability in the joint, retraining of the upper arm, improving the movement technique, joint stability and mechanics used for daily activities by the upper arms (like overhead movements). Ultrasound, electric stimulation, use of ice, laser etc. to decrease the pain in the elbow, reduce inflammation in the surrounding muscles and tendons and improve mobility. Home programs will include exercises which help in stretching, stabilizing and strengthening, along with instructions on how to perform daily activities and how to progress to next level. You can take OTC pain medications like ibuprofen, naproxen or acetaminophen. However, be careful of using NSAIDs like naproxen or ibuprofen which can cause bleeding in the stomach and other such problems. Increased age will put a person at higher risk to such side effects. You should take these medications only as directed and unless advised by the doctor, should not be taken for more than 10 days. When there is a tear in the ligaments, surgery is required to repair or replace the ligament by using tissue from other part of the body. Mostly, located in the forearm, the palmaris longus muscle is used to recreate the torn ligament of the elbow. Once surgery is done, the elbow will be put in a splint helping to heal, and then followed by a physical therapy program. This in turn gets the elbow back to its normal functioning. Use a pillow to prop up your arm when you are sitting or lying down. Try cold compress. Use an ice pack or gel pack which was previously kept in the refrigerator. You can also use vegetables which are frozen. Keep them in a cloth and place on the injured location for around 20 minutes and repeat every 3 – 4 hours.